Choosing whether to designate a patient as inpatient or outpatient has significant reimbursement and compliance ramifications. In 2011, the Centers for Medicare & Medicaid Services (CMS) reported improper Medicare payments of nearly $30 billion, an error rate of 8.6%. 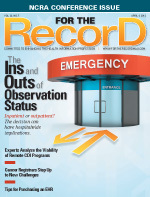 During a conference call with reporters at the end of last year, George Mills, Jr, director of the Provider Compliance Group in the CMS’ Office of Financial Management, said the agency’s Comprehensive Error Rate Testing (CERT) Report showed that a major cause of these errors involved short hospital stays. For example, CERT found that errors occurred because claims were incorrectly coded with the wrong diagnostic-related group, emergency department patients were admitted into inpatient status rather than observation status, or patients underwent elective surgery on a short-day stay rather than outpatient status. As a result of these findings, the CMS has made it clear that the error rate related to patient status remains a consistent problem and has serious implications. What is causing this continued confusion and what can be done about it? According to Day Egusquiza, president of AR Systems, Inc, the difference between inpatient and observation should not be especially difficult for hospitals to figure out. Medical necessity screening tools, such as McKesson’s InterQual, are used by hospitals as guidelines and by payers such as Medicare and Medicaid as a reference. • Stabilization and discharge are expected within 24 hours. • More than six hours of treatment will be required. • Clinical diagnosis is unclear and may be determined in less than 24 hours. • There’s a procedure requiring more than six hours of observation. • There are complications of ambulatory surgery/procedure. • Symptoms are unresponsive at least four hours after emergency department treatment. Egusquiza says observation status is “an outpatient in a bed” where it still needs to be determined whether he or she is ill enough to be admitted as an inpatient or can be sent home safely. However the term is defined, commercial payers will authorize observation only up to 23 hours, while Medicare allows for more than 24 hours if necessary. According to Egusquiza, a 24-hour observation period serves as a kind of artificial deadline for physicians to make a decision about how long it will take to resolve a patient’s condition. According to Karen Kostick, RHIT, CCS, CCS-P, director of professional practice resources for AHIMA, a decision to admit the patient into inpatient status depends on the severity of illness and the intensity of service provided. What happens when a hospital incorrectly designates a patient’s status? “It’s called an audit, which we are all living with right now, and we really have all the payers auditing now because they somewhat believe they’ve found a bonanza here,” Egusquiza explains. Indeed, business does seem to be booming for Medicare recovery audit contractors (RACs). Last April, a CMS report on overpayment recoveries revealed that auditors returned $237.8 million to the federal government in the first six months of fiscal year 2011. “And that’s just the RAC audit,” Egusquiza says, pointing out that Medicaid is now auditing for inpatient status because it believes the records are too weak to support what is being billed. She also predicts that commercial payers will follow suit. All this means that hospital errors regarding inpatient/observation designations can cost hospitals big bucks. Errors can result in a hospital either losing a payment or incurring costs it never recovers, Egusquiza says. “So it means there’s a significant financial hit if you don’t get it right,” she notes. According to Barbara Flynn, RHIA, CCS, vice president of HIM and denial management services for the Florida Hospital Association, this means the facility is on the hook for about 90% of the claim, which represents thousands of dollars. These are dollars the hospital has lost by providing an inpatient stay with the accompanying nursing and room costs but with little in the way of reimbursement. Physicians need to provide an admission order that clearly outlines their thinking when a patient is going to be treated in an inpatient bed, says Egusquiza. Egusquiza adds that nurses’ failure to chart the intensity of service because of a lack of communication between admitting physicians and nurses exacerbates the problem. “So physicians are giving us weak orders, and nurses are compounding the problem by not understanding the level of documentation required for inpatient status,” she says. She also suggests that some physicians may be concerned about liability, particularly when they don’t entirely understand their authority to treat patients in an observation status. According to Egusquiza, while physicians should write—with the best knowledge available to them at the time—the admission order, utilization management committees should be responsible for ensuring the correct decision has been made in the first place. She says best practices dictate that a utilization management staff member should see the medical record before the patient is given a bed, “which means we need to get them [utilization management] in the emergency room,” she says. It’s also good to totally engage bedside nurses so they know the status of the patients they are charting, Egusquiza says. Utilization management should see those patient records on a daily basis. “If we get utilization management up on the floors with the nurses and the physicians, then we’ll have much more aggressive monitoring of the patients’ status and not just of their care,” she says. While Flynn and Egusquiza say it’s important to aggressively train physicians about the importance of making accurate inpatient/observation decisions, it’s problematic when the financial liability for making wrong decisions lies entirely with the hospital. In that sense, Egusquiza says it’s ironic that physicians are the key decision makers despite having no financial responsibility. “That makes it difficult to get everyone’s attention in order to effect change,” she says. That could be changing. Egusquiza points out that some Medicare administrative contractors, such as First Coast Service Options (FCSO) in Florida, have given notice they will start reviewing physician claims. FCSO announced on its website that “effective Jan. 1, 2012, FCSO also will perform post-payment review of the admitting physician's and/or surgeon's [Medicare] Part B services related to inpatient admissions that are denied either because they do not meet the level of care criteria, as services performed could have been performed in a less intensive setting (ie, outpatient) or documentation did not support the medical necessity of the procedure." While the Medicare RAC program successfully reduced erroneous payments, it hasn’t been working fast enough for the Obama Administration. Now a pilot program has been introduced that will allow Medicare RACs to conduct prepayment reviews of certain claims—including those involving inpatient claims—in 11 states. Flynn says this is already having an impact in Florida. While visiting part of a five-hospital system, she learned the facility was ensuring all its documentation was in order before billing.